There are many reasons to cut into an apple tree. If the tree is old and threatens your house, that's a good reason to cut it down. If a young tree is overcrowded in an orchard, it may need to be taken out. If a tree is diseased or dying, it should be removed to preserve the health of other plantings. Do everything you can to rehabilitate a mature apple tree before cutting it down and take every measure to ensure the health of a young apple tree if you are able. Inspect an apple tree before you cut. Each one is different. When planning to take out the entire tree, predict where it may fall, and plan to take major branches down before felling the trunk, especially if higher branches are near power lines. Put on gloves, hard hat and safety glasses to protect yourself from blisters, falling branches and debris that can cause injury. 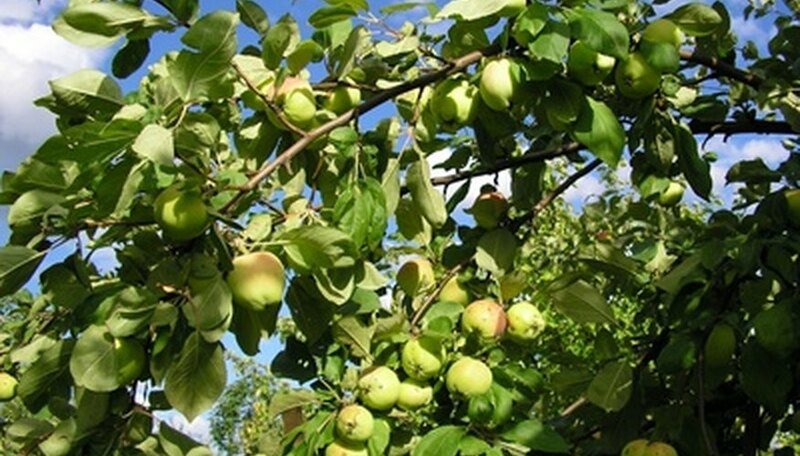 For sapling apple trees, use long-handled pruning shears to clip them off at the ground line. That's all you need to do to remove the tree. Cut branches away from the trunk of mature apple trees from the bottom up. Depending upon the diameter of the branches, you may do this with a set of pruning shears, a handsaw, a long-handled set of pruning shears or a chainsaw. Employ the tool that best fits the task. Cut the trunk of a mature apple tree 6 inches from the ground line, at a 45-degree angle, with a chainsaw. Cut in the direction in which you want it to fall. Make sure it falls away from you, away from the side of your house, other trees and your neighbors' property. Level off the stump near the ground line with the chainsaw and let it decay naturally over the next couple of years. As the stump softens and rots, plant hostas or other hardy perennials to mark the spot where your apple tree once stood.